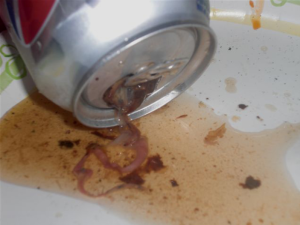 Couple Finds Mouse In Pepsi Can, Later Confirmed By FDA To Be A Toad. remember the mouse that a man in Florida reportedly found in his can of diet Pepsi? Lab tests are back, and it turns out that it wasn’t actually a mouse. FDA tests show that the animal, which the finders said resembled “pink spaghetti” by the time it reached them, wasn’t a mouse. It was a guided frog or toad. The DeNegris took pictures before calling poison control and the FDA, which showed up the next day to examine the can in question and collected for lab testing. The couple received a copy of the completed report last week from the FDA office of regulatory affairs, which concluded the foreign matter appeared to be a frog or a toad. “The animal was lacking internal organs normally found in the abdominal and erratic cavity,” the report notes. A second, closed can from the same 36 pack of diet Pepsi from Sam’s Club, was also submitted for testing, according to Amy DeNegris. no abnormalities were detected, the report states. The problem is that nobody, including Pepsi, knows how the frog, much less a gutted frog, could’ve possibly found its way into the production line. This is not comforting.